We have known for quite a few months now that Worcester’s major local paper was going to start charging online users some kind of fees. 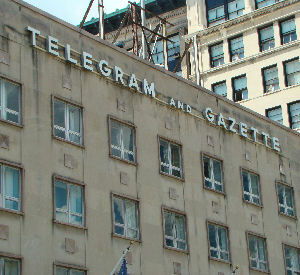 It was announced by both the Telegram & Gazette and the Boston Globe that this “metered model” approach was going to start today. As an organization (DirectoryofWorcester) that embraces the open nature of the web it is hard to see how this approach will work but it has had some success at other newspapers like the New York Times(which owns both the Globe and the Telegram). There are both online software and content providers that just can’t swing producing and providing their services anymore without some form of “freemium” model. There will continue to be experimentation on this front until a new model can be found that can support the cost of producing the services or content involved. If you are not buying a subscription to the physical paper I don’t think you are going to suffer too much from access to only 10 articles a month on the online Telegram website. Though you tend to see many comments about these new fees that think this is the beginning of the end of the Telegram I think you need to consider that they do not have to have everyone paying the $14.95 to access the online site. They only have to have a given number to support their locally produced content. I am sure the debate will continue whether the quality of their locally produced content is worth the fees. Brittany Durgin’s post on the new online Telegram Fees is a good example of how passionate many people are about what is happening in Worcester. She even links to a website that judges the Telegram’s local content as not that valuable. I would challenge the Telegram to produce local content that can be truly appreciated by Worcester residents. By doing so they not only would increase their delivery subscriptions but also ensure that there would be enough online subscribers to make their “metered model” experiment a success. We need to remember that without truly local content we all lose.